In all organs of the body, proteases have critical roles to play both in normal development and functioning and in disease states. The brain is no exception to this, with proteases having emerging roles in synaptic plasticity, memory, neurodegenerative disorders such as Alzheimer's, Parkinson's and prion diseases, ischemia and traumatic brain injury, inflammatory and infectious diseases, and tumor progression. 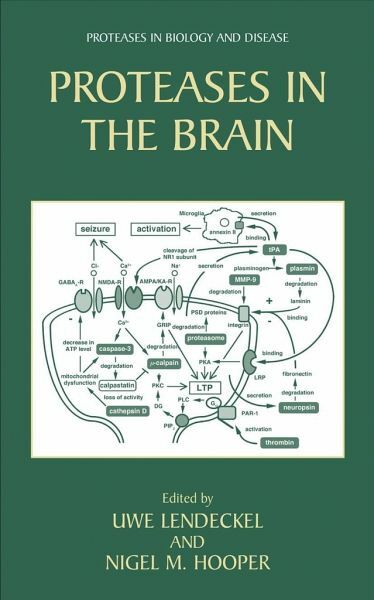 Proteases in the Brain brings together a wide range of topics under this central theme and highlights the large number of proteases involved in these normal and disease processes. Proteases in the Brain reviews the role and regulation of proteases in, Alzheimer's disease, brain ischemia and traumatic brain injury, human glioma, inflammatory and infectious diseases of the central nervous system, metabolism of the prion protein, modulating synaptic activity, multiple sclerosis, neuronal plasticity and memory consolidation, Parkinson's disease, processing, conversion and inactivation of neuropeptides. Proteases in the Brain is a timely and useful source of information both for those well-versed in the role of proteases in the brain, and for those who are beginning to realize the important role of this family of enzymes in brain function and dysfunction.